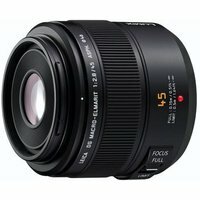 The Panasonic Micro 4/3rds 45mm f2.8 Leica D Vario-Elmar Lens boasts a superb image quality with minimum distortion or chromatic aberration. Ghosting and flare are also reduced thanks to an aspherical lens and an ED lens that both form part of the 14 element construction. Despite its impressive performance the 45mm f2.8 Leica D Vario-Elmar Lens is both light and compact, taking advantage of the Micro Four Thirds standard to achieve dramatic downsizing. Panasonic's MEGA O.I.S. (Optical Image Stabilizer) suppresses the blurring caused by hand-shake, making it easier to shoot sharply focused macro shots, even in dimly lit places, without using a tripod. The closest focusing distance can be instantly changed to 15 cm or 50 cm (0.5 ft to 1.64 ft) with the switch on the lens barrel according to the shooting opportunity. As well as macro photography, the Panasonic Micro 4/3rds 45mm makes an excellent portrait lens.